The streets of Birmingham are piling up with rubbish and fly-tipped waste. Mattresses, fridge-freezers, cardboard boxes, old sofas and countless rubbish bags are being dumped. In Alum Rock, mounds of fly-tipped waste has been dumped on roads in and around Cherrywood Road. 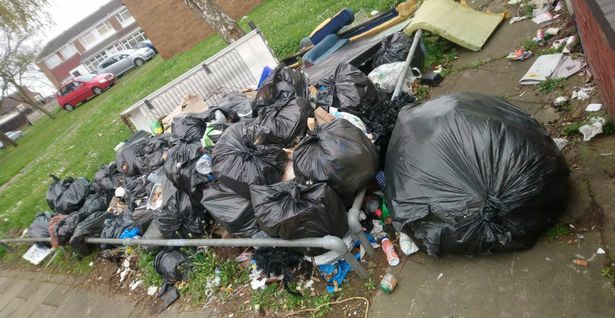 After the Birmingham bins strike ended, a dispute which had seen bags piling up on the street, people are still filling the streets with rubbish. City council bosses approved settlements worth £3,500 each to striking workers in order to end the ‘secret payments’ dispute. A spokesman for the Alum Rock Community Forum highlighted the rubbish piles and branded the local area “a huge tip site”. “Sunday drive around Alum Rock, the area is a huge tip everywhere you look,” said a spokesman. “Many more hot spots created by scum fly-tippers. A Twitter user said: “Used toilets Cherrywood Road B9 4UR, just off Fordrough Lane B9 5LE, flung into the street. “The area is a disgrace with mattresses & abandoned vehicles everywhere. The Birmingham City Council customer service account – @BCC_Help – has been inundated with complaints over the last few days.